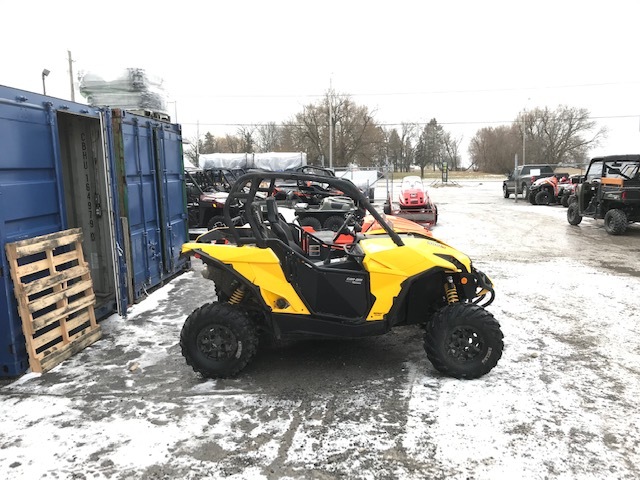 *USED* 2013 Can Am Maverick 1000R, yellow. 5,730 km Excellent condition. Includes half windshield, aluminum skid plates, Pro Armour doors and soft roof. New tires and rims last year. What you’ve been anticipating is finally here. 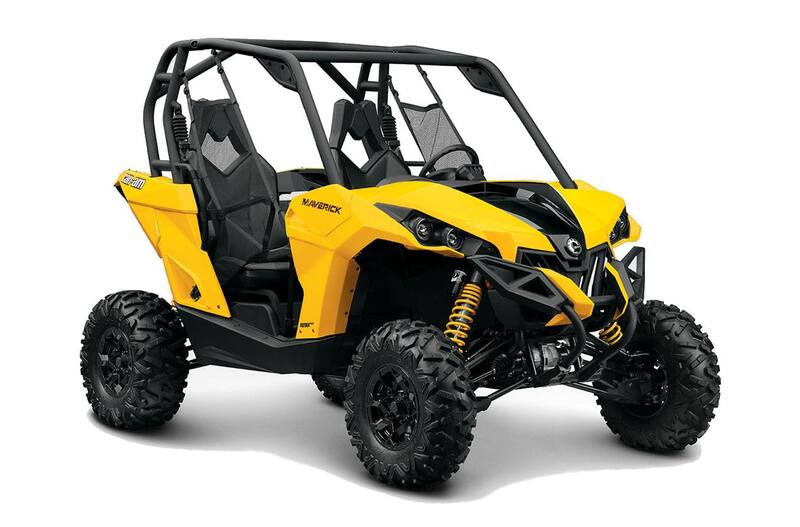 With industry-leading performance, precision-engineered handling and a rider-focused design, the Can-Am Maverick isn’t just a new side-by-side vehicle. It’s a pure-sport vehicle that sets the standard for the industry. Dual exhaust: The dual exhaust uses tuned manifold lengths and resonator chamber to create more flow, optimizing performance and sound. Industry first catalytic converter and closed-loop system ensure optimal combustion from an emission standpoint, meeting new EPA/ CARB standards for 2014 models. 101-hp Rotax® 1000R V-Twin engine: The new 976cc, 101-hp Rotax 1000R V-Twin engine is the most powerful side-by-side engine in the industry (As per manufacturer's official MY13 declaration to the California Air Ressources Board.). This liquid-cooled, single-overhead-cam power plant features four valves per cylinder and is fed by a 54mm Bosch® throttle body and two VDO Seimens® fuel injectors. The sophisticated electronic fuel injection system automatically keeps the engine's performance at its peak, regardless of temperature or altitude. The end result is a high-performance side-by-side vehicle capable of producing the most power, acceleration and best power-to-weight while at the same time maintaining excellent fuel efficiency. Continuously Variable Transmission (CVT) with Zylon®-reinforced belt: The updated CVT system showcases a new belt reinforced with Zylon, a material with 1.6 time higher tensile strength and with increased belt rigidity in compression compared to a regular belt, keeping it cooler. A dual CVT exhaust design also ensures cooler belt temperatures, even in extreme conditions. A redesigned drive pulley with increased diameter will provide extra durability. Standard with engine braking to help slow you when going downhill. High-flow dynamics: When an engine breathes easier, it can produce more horsepower. So we optimized air intake, combustion and exhaust flow to improve engine efficiency. The result is the 101-hp Rotax 1000R. This was achieved in conjunction with increasing the flow volume of the intake plenum and independent intake runners that allow the tuning of each cylinder for optimal performance. A high-flow head to optimize the combustion chamber, thanks to larger intake and exhaust valves and an increased compression ratio (12.0:1), and high-flow dual exhaust all contribute to the more-powerful and efficient engine. Intelligent Throttle Control (iTC™): This electronic throttle-by-wire system works in conjunction with the 54mm Bosch® throttle body to produce smooth throttle delivery, even if the driver's foot is bouncing due to the rough terrain. The iTC system detects unwanted bounces and filters the input, giving you more throttle accuracy, especially at low speed. Drivers can choose between a progressive mode (standard) and a Sport mode, which offers linear throttle control. This system also reduces the number of moving parts in the vehicle; requires no maintenance; has no cables to adjust, lubricate, or replace; and the system has an increased life span. 27-in. (68.6cm) Maxxis Bighorn 2.0® tires: The non-directional, six-ply Maxxis Bighorn 2.0 radial tires offer an extremely durable carcass, yet are lightweight in design to reduce unsprung weight. This tire provides a smooth ride, predictable feel over a variety of surfaces while at the same time offering sturdy lugs and a capable tread pattern to let you drive with confidence. 13-in. (33cm) of ground clearance: The Maverick has 13 inches (33cm) of total ground clearance for optimum performance in challenging terrain. The suspension and frame were engineered to produce a vehicle that can tackle rugged terrain in predictable fashion while also remaining precise in aggressive cornering. FOX® PODIUM® X Performance 2.0 piggyback shocks: The Can-Am Maverick features front and rear FOX® Podium X Performance 2.0 HPG piggyback shocks with compression and preload adjustments so you can set-up the ride to whatever playgrounds you choose to tackle. Re-buildable design allows for easy service and valving changes. This shock features dual-rate spring, high-volume 6-in. piggyback reservoir, velocity sensitive damping control, hard-anodized aluminum body, forged piggyback body cap, hard chrome plated, heat-treated shaft, upper and lower bearing mounts, racing-developed high-flow piston and specially formulated oil for optimal performance at variable temperatures. Front and rear dual 214-mm ventilated disc brakes: The four-wheel disc braking system on the Maverick 1000R consists of front 214mm hydraulic disc brakes with twin-piston caliper and 214mm rear hydraulic disc with a single-piston caliper for great stopping power. Torsional Trailing A-Arms (TTA) independent rear suspension: The innovative TTA rear suspension on the Maverick 1000R is engineered to be compact, lightweight, efficient and deliver the performance sport enthusiasts demand. This is a compact version of a five-link suspension for no bump steer and the lowest scrub for optimized bump absorption and tire-to-ground contact. It also has less rear unsprung weight than other sport side-by-side. The system features a double A-arm setup where each A-arm acts as two links and uses a toe-control link as the fifth link. The result is a more condensed and lighter package with less pivot points and spherical ball joints making it more durable because it reduces free play and wear, and is more resistant to undercarriage damage. Engineers designed the TTA to allow for optimal geometric weight transfer to enhance the tire-to-ground contact, while at the same time increasing its bump absorption, traction and, ultimately, overall control of the suspension. Offers 14 in. (356mm) of travel. Visco-Lok® auto-locking front differential: Exclusive to Can-Am, Visco-Lok is a progressively and automatically locking front differential system, once 4x4 mode is selected. The system intelligently transfers power from a slipping front wheel to the opposing wheel with traction. Visco-Lok has no buttons to push or levers to pull. Plus, there’s no wheel hop or driveline wind-up so the system is totally transparent to the driver and extremely easy to steer. Visco-Lok gives progressive lock-up with no rev or speed limiter. Mid-engine layout and weight distribution: Other sport side-by-side vehicles feature engines toward the rear, increasing inertia and tendency to oversteer. Our Can-Am Maverick engine is toward the center - between the two seats. Centralizing weight leads to more agile steering and easier cornering. Plus, an ideal weight distribution for improved traction and handling. Add in a 84.3-inch wheelbase and 64-inch width, and the result is a nimble Maverick that is as predictable and confidence inspiring as it is powerful and dynamic. 12-in. Center-less cast-aluminum wheels: This stylish center-less cast-aluminum wheels were computer-optimized to add strength and durability in strategic areas while eliminating excess material in other spots to reduce unsprung weight. Double A-arm front suspension: The double A-arm front suspension front suspension features 14 in. of travel for a capable and precise ride. 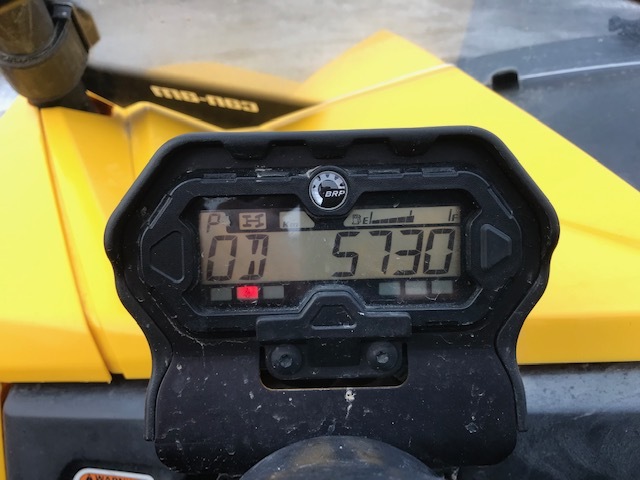 High frame rigidity: The torsional rigidity of the Can-Am Maverick is almost two times higher than the Polaris RZR XP 900®. We made it that way because a rigid frame doesn't interfere with suspension, allows for more precise calibration and gives the driver better feedback. 8.3 gal (31.6 L) of cockpit storage: The onboard storage consists of a 4.5 gal (17.2 L) glove box and a 3.4 (13.1 L) storage space beneath the driver’s seat. Convenient and versatile cockpit storage space so you can take your essentials with you. Advanced ergonomics: The passenger handholds and grab bar increase comfort through a variety of conditions and riding styles. The cockpit layout offers ample space, has lots of legroom and enables important driver information to be clearly displayed. Plus, controls are strategically placed at your fingertips so you don't have to think twice while driving. Removable free-standing seats: The seats in the Maverick are removable and freestanding, which means you and your passenger can feel as comfortable in them at the campfire as you have during your trail journey. The seats are designed to offer both lumbar and lateral support, providing comfort even in the roughest of terrain. 625-W magneto: Standard with a powerful magneto with 625 W of power output. Quick-attach side nets: Designed to keep a clear field of vision for both the driver and passenger, the side nets on the Maverick can be opened and close with just one click. Get in and out quickly with this simple one-hand and one-click system. Adjustable driver seat and tilt steering: Premium seating with a full backrest, lumbar and shoulder support and side bolsters for lateral support during aggressive riding. Tilt steering and an adjustable driver's seat are easily adaptable to a range of drivers and driving styles. No tools required. Easy-to-use maintenance center: Easily accessible and out of the elements under the hood, a centralized maintenance area allows access to the air box, radiator and coolant overflow. Fuses and relays are also easily accessible. 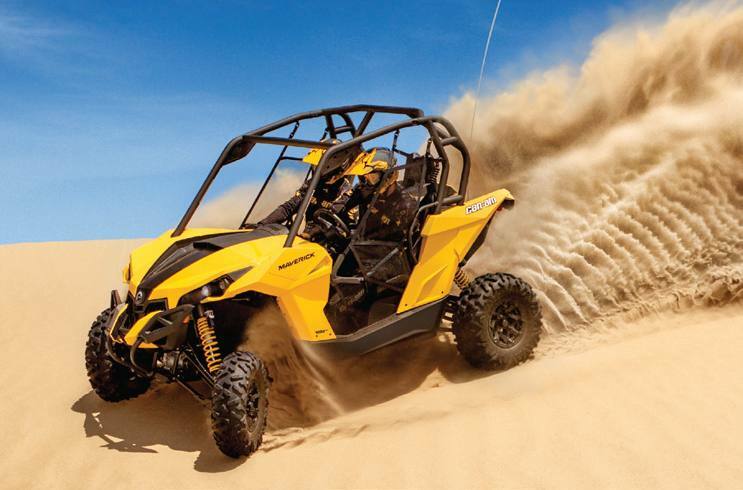 240-W lighting: The Can-Am side-by-side vehicles family features a 240-W lighting system. Automotive-style projectors, on each side, run at 120-W in low beam and 240-W in high-beam mode. Passenger handhold and grab bar: The passenger handhold and grab bar provide a comfortable location for passengers' to place their hands while riding off-road. Ergonomically designed passenger handholds are located immediately in front of the passenger and to their left-hand side. The dual handhold design features ergonomically friendly bends and optional hand placement for supreme comfort and convenience. Multipurpose rear rack with LinQ quick-attach system: The high strength, multipurpose rear rack works with the LinQ quick-attach accessory system, letting you quickly and easily install or remove a storage box, rack extension, bags or other items. An optional bed liner offers even more storage space for increased versatility. The rack features an integrated anti-skid surface and elevated ridges for improved cargo holding. Numerous edges and holes improve use with tie-downs and bungee cords. 200-lb rear rack capacity. Dual cup holders: Dual cup holders, located in the center console, have rubber flaps for off-road use. Digitally Encoded Security System (D.E.S.S.™) anti-theft system, with 2 different keys: D.E.S.S. is the industry’s first standard anti-theft device. Electronic code in key must match code in ECU to start. The Maverick 1000R family comes with two different keys. One that limits top speed to 44 mph (70 km/h). The second key is the performance key that has no limitation on speed or power. 2-in. (51mm) Diameter, high-strength steel, ROPS-approved cage: 2-in. (51mm) diameter, high-strength steel cage designed around the Rollover Protective Structures (ROPS) industry standard. Meets the requirements of the ANSI/ ROHVA 1 -2011 standard for ROPS, with the ISO 3471 option in section 10. Multifunction digital gauge: The Rectangular LCD gauge, which offers a speedometer, odometer, clock, trip meter and more, is mounted to the steering column so it adjusts with the steering wheel and stays within the driver’s sight lines. Rear Suspension Type: Torsional Trailing A -arms (TTA) independent rear suspension with sway bar. 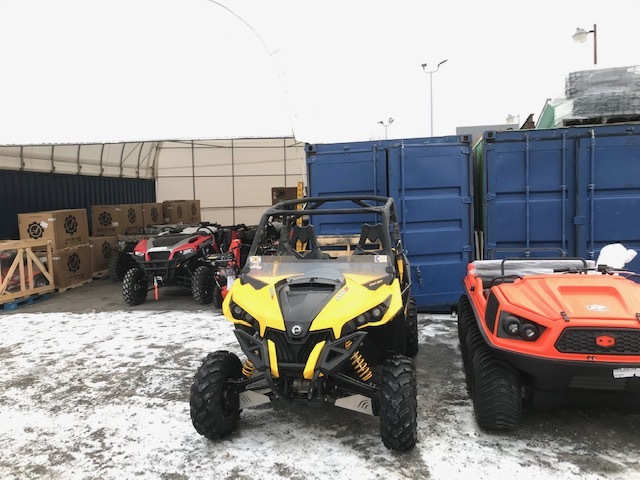 BRP reserves the right, at any time, to discontinue or change specifications, prices, designs, features, models or equipment without incurring obligation. Some models depicted may include optional equipment. Read the side-by-side vehicle (SSV) Operator’s Guide and watch the Safety DVD before driving. For your safety: wear a helmet, eye protection and other protective gear. Fasten lateral net and seat belt at all times. Always remember that riding and alcohol/drugs don’t mix. SSV is for off road use only. Never ride on paved surfaces or public roads. Operator must be at least 16 years old. Passenger must be at least 12 years old and able to hold handgrips and plant feet while seated against the backrest. Never engage in stunt driving and avoid excessive speed. Drive responsibly. Torsional Trailing A -arms (TTA) independent rear suspension with sway bar.